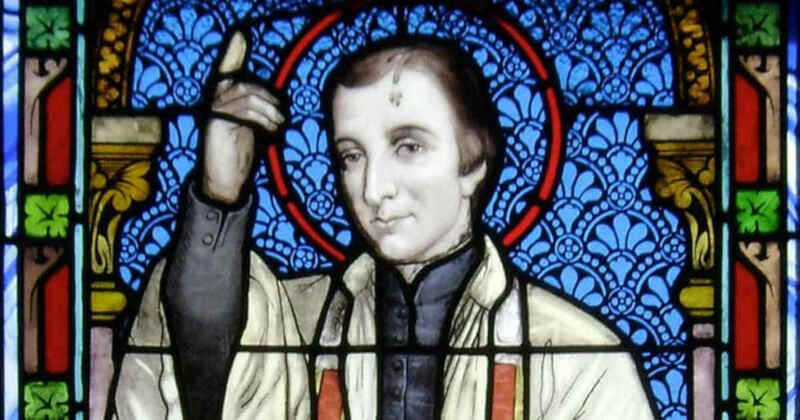 Saint Peter Chanel, Priest and Martyr - My Catholic Life! In Paris, just a few blocks down the Rue du Bac from the shrine of the Miraculous Medal, is a fine, imposing stone building. There are a lot of fine, imposing stone buildings in Paris, so from the outside this one is not exceptional. But once the visitor passes inside the complex of chapel, museum, dormitories, and garden, he understands what a venerable institution he is visiting—The Paris Foreign Mission Society. Approximately 4,500 missionaries went forth from this unique Society, mostly to Southeast Asia, to build the Church and preach the Gospel. From its beginnings in the seventeenth century until today, but most conspicuously in the nineteenth century, hundreds of priests and bishops from the Society were martyred, died violent deaths, or fell victim to tropical diseases. Of these, twenty-three Paris Foreign Missionaries are canonized saints. Other non-martyr French saints of the same era—Saint John Vianney, Saint Thérèse of Lisieux, Saint Catherine Laboure—together with the missionary martyrs, sparkle as the jewels in the crown of the vibrant Church of nineteenth-century France. Today’s saint, Peter Chanel, was just one such Frenchman who left the comfort and familiarity of home to become a daring and rugged missionary priest. Peter Chanel grew up in rural France working as a shepherd. While in school he loved to read about French foreign missionaries and wanted to emulate them. So he decided, “I will become a missionary priest!” After seminary studies, Peter was ordained a diocesan priest and served in parishes. But a few years later, he became one of the founding members of the Society of Mary, the Marists. And as a Marist father, he voyaged on the high seas to at last fulfill his missionary dreams. He sailed to one of the most tiny, remote, and unknown islands in the South Pacific. In 1837, Father Peter Chanel stepped ashore the speck of volcanic rock called Futuna to preach there, for the very first time, the name of Jesus Christ. On unknown Futuna, Father Chanel gave his all, at first drip by drip and then all at once. A lay brother who was with him later said of Father Chanel, “Because of his labors he was often burned by the heat of the sun, and famished with hunger, and he would return home wet with perspiration and completely exhausted. Yet he always remained in good spirits, courageous and energetic…” His apostolic labors generated few converts, but there was some progress nonetheless. Like so many missionaries, Peter had to overcome the counter-witness given by fellow European Christians trading in the area who cared little about their religion. In 1841, when the local Chieftain’s son asked to be baptized, the Chieftain sent his son-in-law, Musumusu, to stop the conversion. A fight within the family ensued. Musumusu then went to Father Chanel’s home and clubbed the priest with an axe until his blood puddled in the dirt. Father Peter was not yet forty years old when his missionary dream was fulfilled in martyrdom, giving Oceania its patron saint. The island of Futuna, in which our saint had such mixed success, converted completely and totally a few years after Saint Peter’s martyrdom. Musumusu himself repented of his crime and was baptized. The island is, even in modern times, almost one hundred percent Catholic. An impressive church is the heart and center of every small town. Saint Peter Chanel’s body now rests in a large Basilica in the city of Poi. The beauty and smell of tropical flowers always adorn the church. And on the night of April 27, the vigil of his Feast Day, hundreds of Futunians sleep outside the Basilica waiting for the festivities of their saint’s feast day to begin the next morning. The brief life and sudden death of Saint Peter Chanel is powerful proof of how the blood of the martyrs waters the seeds of the Church. One sows, another reaps, and still another enjoys the harvest. Saint Peter Chanel, by your suffering and death, you converted a people. You were fearless in adventuring far from home to preach the Gospel. May your blood, spilled so long ago, continue to infuse all missionaries with courage and perseverance in their labors.